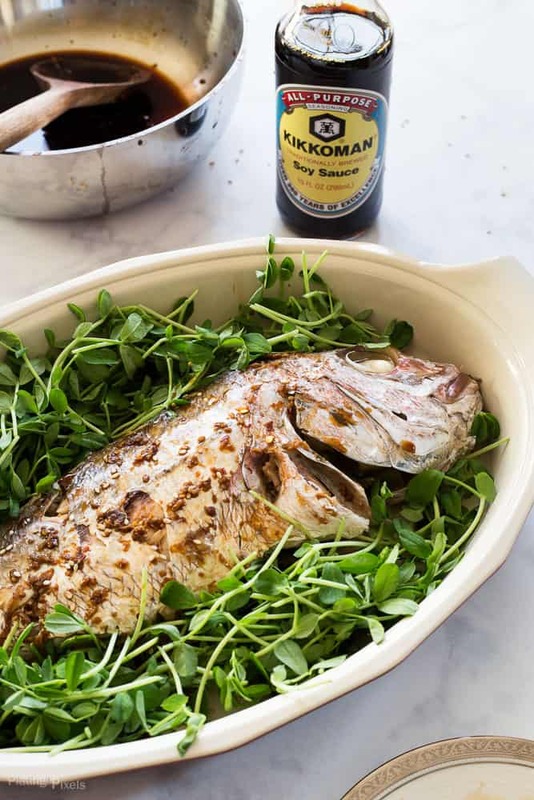 Within this recipe post you’ll how to steam a whole fish, it will cook perfectly and wow your guests. It’s easier than you think and you should totally try it! 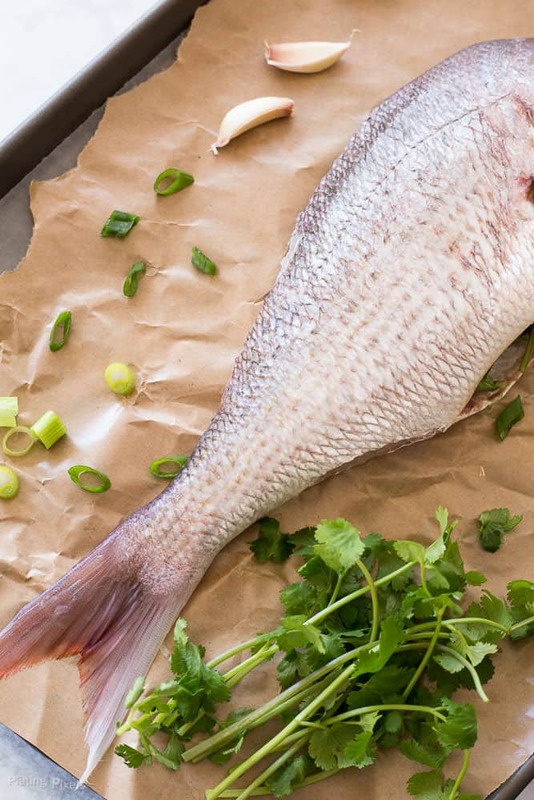 Plus you’ll learn an easy way to cut and serve this beautiful whole steamed fish. Oven steamed Soy Sauce Glazed Whole Steamed Fish. Easy whole cooked fish baked in oven comes out super moist and tender. Ginger, garlic, maple and soy sauce glaze on top. Fish is a commonly enjoyed dish during Chinese New Year and ideal for the Lunar New Year. The Chinese word for fish, yú, sounds like the Chinese word for abundance. I can’t think of a better way to start the new year than with abundance. To celebrate this tradition, I’m making a whole steamed fish, which is a first for me, but was way easier than I thought it would be! Once cooked, add a homemade maple ginger soy sauce glaze. 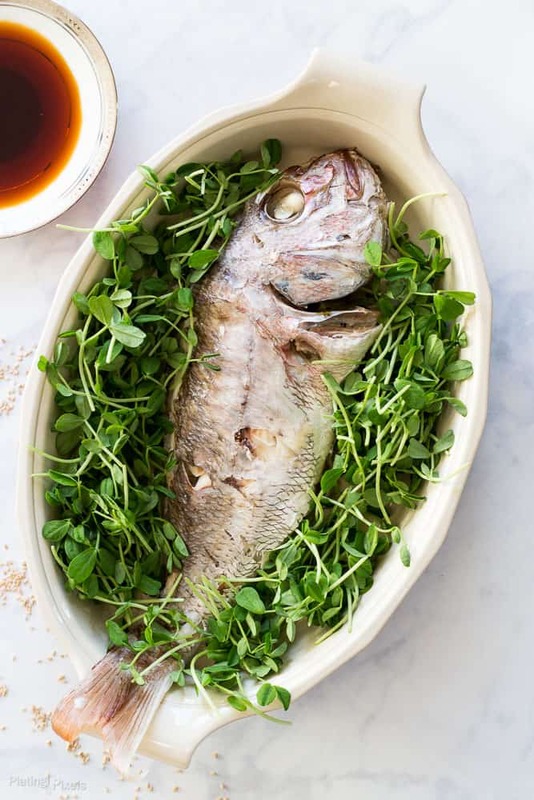 To be honest I’m a bit squeamish with whole fish, but this recipe is so simple that anyone can do it. When you buy fish at the store, make sure you get the freshest one you can find; the eyes should be clear and not cloudy. The fishmonger will clean and descale the fish, which is the most difficult part. I used snapper, but you could sub with bass, sole or trout. Now that the hard part is out the way you can get to prepping and steaming the fish. I don’t have a steaming basket large enough to hold a whole fish, so instead I wrapped it in foil and baked; steaming it in its own heat and juices. Stuffing green onions, cilantro and garlic into the fish while steaming embeds those flavors throughout. 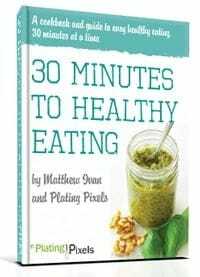 I used soy sauce in this recipe, as well as most of my Asian inspired dishes. 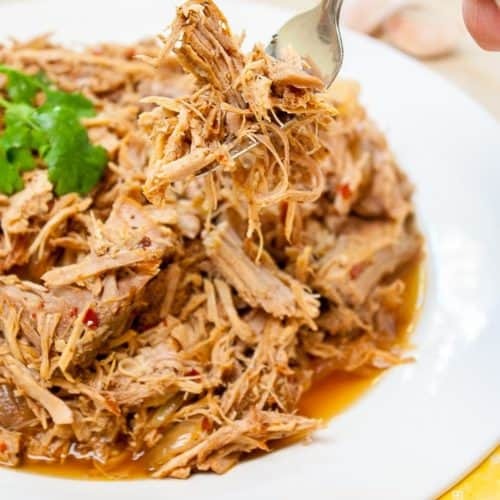 It can also be used as a versatile ingredient in so many more dishes. I use it to add umami flavor to my Mexican fajita marinade. You could also sub it out for salt in some dishes. 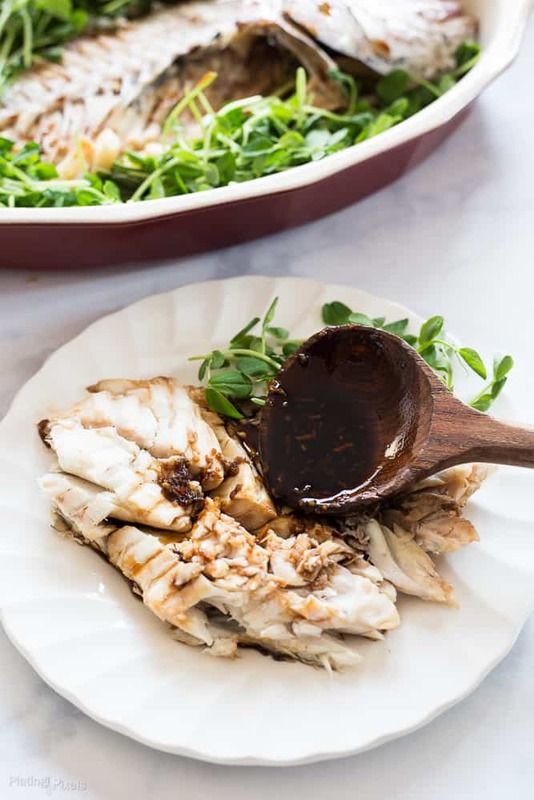 Using a ½ teaspoon of soy sauce, instead of ½ teaspoon of salt, cuts the sodium content by 1,000 mg. For this Soy Sauce Glazed Whole Steamed Fish recipe, no salt is needed, not even sprinkled on before steaming the whole fish. 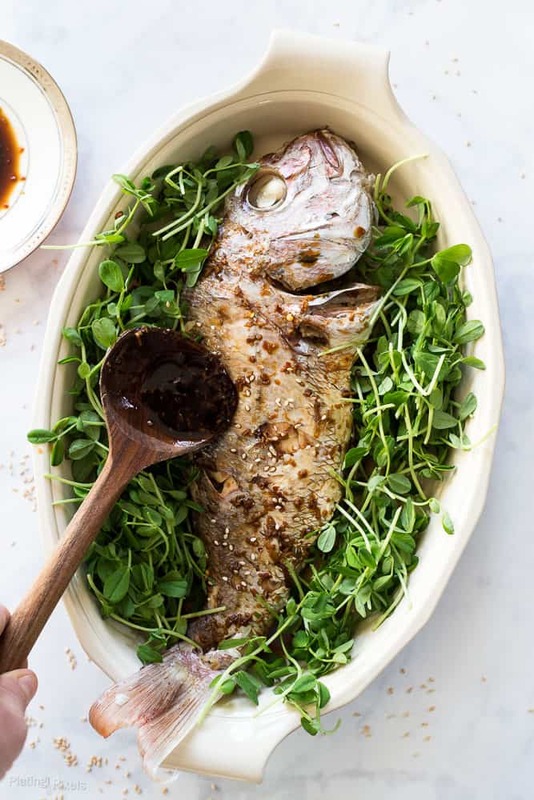 Whole steamed fish, with the soy sauce glaze is an impressive, creative and unique recipe for Chinese New Years. Steaming ensures you’ll end up with perfectly cooked, moist and tender fish. Once you steam your whole fish in the oven and the glaze is ready, unwrap from foil and serve immediately. I recommend placing it on the table whole for that wow effect. To serve, carefully use a knife to cut along the top of fish, near the spine. Just a light cut to loosen the meat. Then with a fork, loosen the meat completely along the spine. Use a spatula to lift the top fillet off the fish. Now you can easily remove the entire spine and bones by lifting from the tail and carefully removing (the head will most likely come off with it). The bottom half of the fish will be ready to eat now as well, besides any loose bones that may need to be picked. Flavor profiles: Overall flavor depends on the fish used. 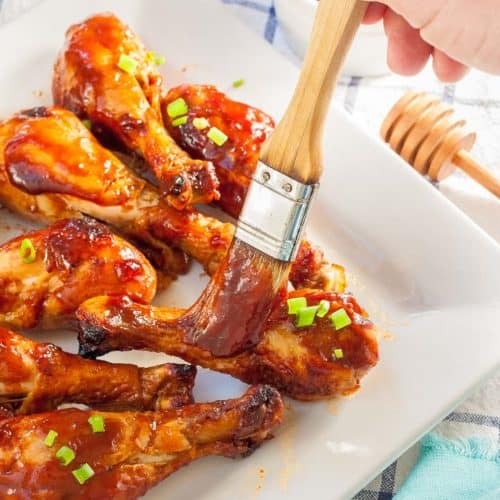 Glaze adds a umami, salty and sweet flavors that pair perfectly (plus it has a bite of fresh ginger). Texture: Soft, flaky and moist perfectly cooked fish. Dietary Options/Substitutions: Use low sodium soy sauce to reduce sodium. Easy whole cooked fish baked in oven comes out super moist and tender. Ginger, garlic, maple and soy sauce glaze on top. Preheat oven to 375° F. Stuff center of fish with cilantro, green onions and whole garlic cloves (do NOT add salt to fish). Wrap entire fish with 2 layers of foil to completely seal; this is what keeps the steam in so make sure it’s enclosed. Bake about 40 minutes, until meat is tender and flakes off with a fork. Remove from oven and keep in foil until ready to serve. You can make glaze while fish is in oven. To make glaze: In a medium pan add soy sauce, maple syrup, ginger, remaining minced garlic and chili flakes. Heat over medium, stirring often and bring to a low boil. Reduce heat and simmer for 5-10 minutes to thicken. Remove foil from fish and place on a large platter and add pea shoot leaves around it. Drizzle half of glaze on top and garnish with sesame seeds.. Cut fish and serve (see cooking tips section above for an easy method). Drizzle additional glaze on top of fillet meat. I live in Japan and cooking whole fish is so popular here! I’ve never done it because I just didn’t know how. I need to give this recipe a try. Thank you for sharing. It looks delicious. I would love to visit there sometime. Glad I could provide some helpful tips and thanks Allison! LOVE this!! Such a simple and wholesome dish 🙂 Love the styling too!! It’s surprisingly simple! Thanks so much Swayam! My husband would love this kind of dish 😀 Hopefully I can whip it together in time this week for CNY! The main thing is finding a good fish then it’s super quick! Enjoy Chrisy! Wow – this looks amazing! I grew up eating whole steamed and baked fish, but I’ve never made one myself. I love the tips you provided about how to serve the fish. They’re so helpful! You’re welcome and thank you Aida! It was new to me but may become a regular rotated menu item! Never in a million years would I have dreamed of making a whole fish…but this post makes me think I could do it! And oh, the drama when presenting it at the dinner table. I think I might give this a whirl! Haha we thought the same thing Kate! But it was so easy. Ate this all to ourselves but it would get some good reactions when served to guests! I love whole steamed fish. Usually make it for hubby every once in a while using a variety of glazes most of which include kikoman’s soy sauce. 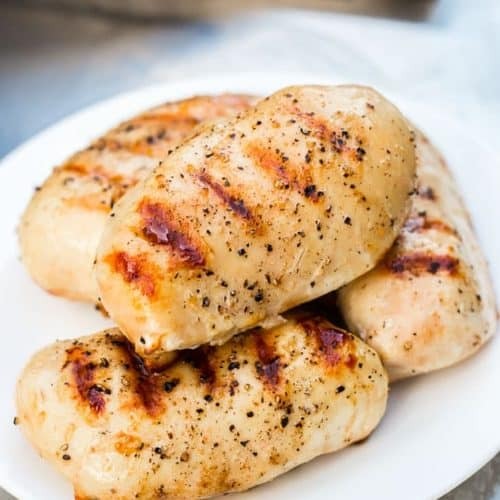 My favorite way to finish it off is to add a bit more glaze and broil for 3-5 mins on each side and serve with a salad. Super filling, feels fancy and doesn’t take much time. I will have to try making it with your glaze. Thanks for the comment Zainab! I bet you could do all sorts of things with glazes. I’ll have to try your method of broiling. I bet in infuses the flavor even more! That fish is GORG. I’ve always been to scared to cook a whole fish like that, skin and all. But love when I order it that way at restaurants. You are brilliant! I’ve never had whole fish till recently, even in a restaurant. Now you can make it at home! Thanks Chrissa! Me neither till now Lauren. But was so worth it! You’re welcome and thanks! This would wow indeed. It was way more simple than I thought. Not much different than cooking with any other meat as far as hands on work. I think you totally could Tracy! I love to make steamed fish but I never think to glaze it. I will have to try this. It compliments the fish so well. I bet you’ll love it. Thanks!